Undercover Israeli soldiers attacked, Thursday, two young Palestinian men in occupied East Jerusalem, causing one to lose consciousness, and abducted the other young man, in addition to abducting a young man from al-‘Isawiya town, while dozens of soldiers invaded various areas in the city and installed roadblocks. Media sources said the undercover soldiers assaulted the two Palestinians in Sultan Suleiman Street, between Damascus and the Sahera Gate in the Old City, causing one of them to lose consciousness, before he was rushed to a local hospital, and abducted the second young man. The soldiers also invaded homes in the al-Isawiya town, in the center of Jerusalem, and searched them before abducting a young man, identified as Amir Karkash. 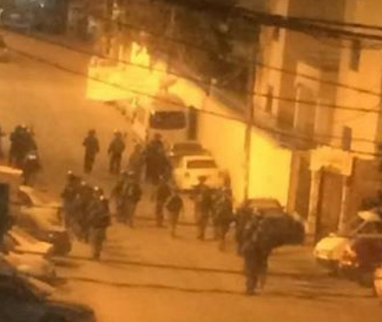 On Wednesday evening, the soldiers invaded the al-‘Isawiya town, in Jerusalem, and fired at dozens of protesters. The town has been surrounded by the soldiers over the last two months and witnesses daily invasions. Dozens of soldiers have also been deployed in Jerusalem, especially in the area extending from al-Misrara neighborhood, Bab al-Amoud, Sultan Suleiman Street, Sahera Gate in addition to Salahuddin, Rashid and Az-Zahra’ Streets, and installed sudden military roadblocks at several gates of the Old City. Furthermore, the soldiers invaded, on Thursday at dawn, Hebron city in the southern part of the occupied West Bank, searched many homes and attacked several Palestinians before abducting one. The soldiers also invaded Jenin city, Jenin refugee camp and Deir Abu Da’if village, east of Jenin, in addition to Nablus, in the northern part of the occupied West Bank, searched many homes and abducted four young Palestinian men.